High power 250W UFO LED high bay, UFO 250W LED industrial light, 250W UFO LED low bay light, 250W LED high bay light, 250W LED warehouse light. High quality CREE 3030 LED chip, 34800Lm high brightness. High power 250W UFO LED high bay, UFO 250W LED industrial light, 250W UFO LED low bay light, 250W LED high bay light, 250W LED warehouse light. High quality CREE 3030 LED chip, 34800Lm high brightness. 60° 90° 120° beam angle optional, 50,000 hours lifetime and 5 years warranty, US UL ETL approved. 250W UFO LED high bay can replace traditional high power 750W HPS. UFO LED high bay light are in a great demand indeed. it’s now kind of a new form of high bay on the market and already took the place of traditional /conventional high bay lamp, because of their proven performance and good price. 1. Super brightness of 130-150LM/W, excellent lighting performance even in height of 15’ or higher. 2. PHILIPS LEDs, 60° 90° 120° beam angle. 3. Multiple voltage choices, AC85-265V / 100-277V / 100-305V or 347V customized. 4. 250W UFO LED high bay is brighter than a 750 Watt high pressure sodium(HPS) lamp, saving up to 75% in electricity and hundreds in unnecessary replacements. 5. IP65 high protection rating, moist conditions available. 6. Multiple installation and add-on options (with reflector. or 2 pin / 3 pin plug can be fitted on request). 7. Cost-effective, much more affordable than other products with similar efficiency. 8. CE, RoHS, UL Certified, guaranteed quality. 9. Good choice for new installation or retrofitting traditional lighting fixtures like HPS, MH, CFL, etc. 10. Extensive application, suitable for warehouses, sports halls, shopping centers, manufacturing plants, large conference areas, high space commercial buildings, or similar occasions. 100W UFO LED high bay, UFO 100W LED industrial light, 100W UFO LED low bay, 100W LED high bay lights, 100W LED warehouse light. High quality CREE 3030 LED chip, 14500Lm high brightness. 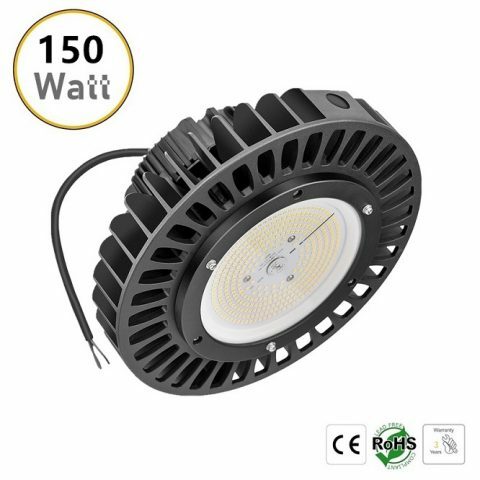 150W UFO LED high bay, UFO 150W LED industrial light, 150W UFO LED low bay light, 150W LED high bay light, 150W LED warehouse light. High quality CREE 3030 LED chip, 21750Lm high brightness. High power 200W UFO LED high bay, UFO 200W LED industrial light, 200W UFO LED low bay light, 200W LED high bay light, 200W LED warehouse light. High quality CREE 3030 LED chip, 29000Lm high brightness.